Oliver Knussen (born 1952) leapt to fame in the early 1980s with the Glyndebourne production of his spectacular opera �Where the Wild Things Are�; in a rare interview, this colourful composer tells Daniel Jaff� how writing for children changed his music. A slightly shortened version of this article was published by Classic CD, February 1999. �One thing I feel very lucky in,� says Oliver Knussen, �is that I think my response to music has remained pretty much unchanged since I was a kid. It�s basically what I breathe; I can�t imagine it not being there.� Something of a child prodigy, Knussen had the inestimable advantage of being born into a musical family: his father, a professional double bassist, played in several premieres of Britten�s music. Aged 15, Knussen himself conducted the London premiere of his own First Symphony. While readily admitting the advantage of hearing his orchestral works almost as soon as they were written, he regrets that making such �big risks� under the inevitable glare of publicity �possibly made me a bit too cautious�. Certainly his notorious slowness in composing has affected his latter career � nowadays he is in greater demand for his formidable conducting skills. But what music! Had Ravel absorbed more of Stravinsky�s angular style, plus something of Berg�s rigorous sense of structure and his more outlandish flights of imagination, his music might have ended up sounding rather like Knussen�s. Other parallels could be drawn between Knussen and Ravel: both are meticulous miniaturists, brilliant masters of the orchestra, profoundly guarded about the �meaning� of their music and � perhaps most strikingly � both combine a child-like, almost na?ve delight in music with a profound understanding of it at its most �advanced� (Ravel was one of the very few musicians who understood Stravinsky�s Rite of Spring from the start). When asked about more personal matters like his actual creative work, he is a touch more diffident and draws his right arm across his expansive belly, clutching his left elbow while he chain smokes. But he is pleased when, upon mentioning that he is to record his two operas � Where the Wild Things are and Higgledy Piggledy Pop! (both based on children�s books by Maurice Sendak) � I let slip that I have a much loved LP of the former: he then tells with relish why that LP �sounds much better than on any other format of Wild Things�. 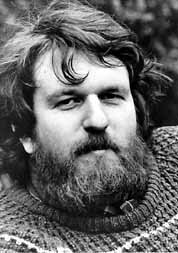 Wild Things was first recorded in the early days of CD: without such technical marvels as sound compression to cope with the work�s enormous dynamic range, the overall sound level had to be �jacked down� (as Knussen says) to a rather dull, flat sound. Disappointed by this, Knussen was then told by the record company, Unicorn Kanchana, that the LP version was to be cut at Decca�s plant. Excited at the prospect of having his music �cut� by the firm responsible for such sonic spectaculars as Solti�s Ring cycle and Salome, Knussen came along and watched as two senior cutting engineers made an initial test cut. Finding the result disappointing, Knussen asked if they�d worked on Solti�s famous recordings. �Oh yes, sure�, they answered. �Well why does that sound so different?� he asked. �D�you mean this?� said one of the engineers, and, Knussen recalls, �flicked two switches and this sound came out� � big, sonorous and exciting. �It was just something they�d never done unless they were asked to!� says Knussen with evident delight. Knussen is particularly looking forward to recording the final full version of Higgledy Piggledy: �the circumstances I wrote it in made it very late [for its first performance] so it was done in various unfinished or temporary versions. It never really had the chance that [Wild Things] did. So I�m busy sprucing it up and getting it exactly the way I planned it to be in the first place. It would be lovely at some point to be able to reintegrate a new recording with the old visuals, which still exist of course on video.� The video is something of a poignant memory for Knussen � �I can�t listen to it now�; on one hand it is a memento of Maurice Sendak�s wonderful stage sets, �now destroyed, courtesy of Glyndebourne�; on the other, the music was incomplete when the video was made, so stretches now linked by orchestral interludes were then filled by �a sort of bit of a wallpaper that I did�. We return to Knussen�s Takemitsu piece unexpectedly when I ask him about a comment he once made � �You don�t plumb your depths to write a terribly self-expressive piece�; so does he agree with Stravinsky that music could not express anything? �Ooh no,� he says, most emphatically. �No, that�s quite precise. He said �Music by its very nature is not capable of expressing anything�. Now, listen to one bar of The Rake�s Progress, or The Fairy�s Kiss or the Requiem Canticles, and you realise that it�s either a major smokescreen or he meant something else. But what I think he meant was �not capable of expressing anything concrete�. Now I don�t think a composer who is actually writing a piece of music should be conscious of self-expression. I hate the idea of somebody sitting down and thinking �Alright, I feel sad� or �My cat�s just died. I�m going to write a Requiem Mass for the cat�. �On the other hand if somebody wants to remember something � for example look at what I did with the Prayer Bell sketch, the piano piece in memory of Takemitsu: he was a person I cared a lot about as a friend � I was devastated when he died. I took a chord that he used in virtually every one of his pieces in the �80s and I took a title that he hadn�t used � because he was going to write a piece called Prayer Bell at some point � and I took various little objects that reminded me of him in that way, and I then fashioned a little piece from that; it was like taking his chord for a walk around various objects that I associated with him, or various ways of thinking. But you have to invent technical procedures to do that. Symphonies Nos. 2 & 3; Coursing; etc. Philharmonia Orchestra/Tilson Thomas; London Sinfonietta/Knussen; etc. Hums and songs of Winnie-the-Pooh; Sonya�s Lullaby; Oc�an de terre; etc. Horn Concerto; The Way to Castle Yonder; Whitman Settings; etc.